Noel Hunt insists he left behind a ‘winning formula’ at Wigan Athletic that he expects to continue its success next season in the Championship. 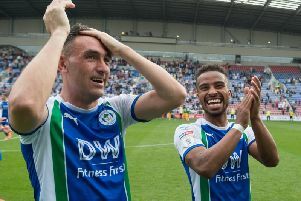 The 35-year-old, followed Paul Cook from Portsmouth last summer, played a mainly supporting role as Latics won the League One title in a memorable campaign. Despite being offered a further 12-month deal, he elected to return to his native Ireland to take up a player-assistant manager role with Waterford. But he left with nothing but kind words for Latics and Cook – from whom he’s hoping to have picked up a few managerial tips. “I’ve been around football for a good few years, and I knew there was a winning formula here,” said Hunt. “You look at the gaffer, and his record in recent years...it’s frightening! “His stock must be so high at the moment, Wigan are lucky to have him, and hopefully they can keep moving forwards. “I wouldn’t say he’s unique, but he has a different style of play that I’ve never seen before. “And it’s proven time and time again, year after year, the way he wants to play is working. “Everyone also knows where they stand with him - and that’s a massive factor in this business. “Honesty is a big thing for me, and I love the way he is and the way he treats players.